French Polynesia is a vast territory; its whole surface is the same size as that of Europe. 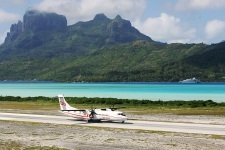 Flying is still the only way to travel from Tahiti to several islands. Air Tahiti is the only airline company that flies from Tahiti to 47 islands which have their own small airport or aerodrome. Pol’Air is a private company for private flights. Departing from Tahiti, it is also possible to go to Moorea by boat. By ferry it will take 45 minutes on average to get to the sister island and 25 minutes by catamaran. Schooners and cargo liners depart from Tahiti to other Polynesian islands. once a month for the Gambiers Archipelago and more precisely Mangareva.